This is a hard review to write. I feel like I really need to separate this review into two parts: the plot and the characters. The plot was incredibly interesting. 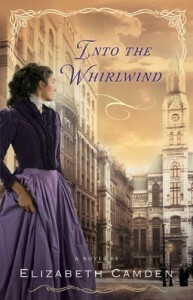 Into the Whirlwind took place during the Great Chicago Fire. The characters were actually in the fire and experienced it first hand. I was a little shocked that the fire took place within the first few chapters of the story. A majority of the story was how the city rebuilt itself and how Mollie rebuilt her watch shop. I found the story incredibly interesting and engaging. There are very few books out there about this subject and it was a little refreshing to read a book that broke the mold. The real beef I have with this book are the characters. I didn't like any of them! I have to say, I sided with Mollie most of the time. I found Zach to be incredibly rude and downright mean to Mollie. At the end, Mollie apologizes and Zach is looked at like a hero- though he still is a jerk! I don't think I am catching what the author is throwing on this book because I didn't want either guy to get the girl. I wanted her to tell both of them to buzz off and ride off into the sunset alone. Into the Whirlwind was a decent book. It had an interesting story, but the characters were so unlikable it was a bit of a struggle to finish.